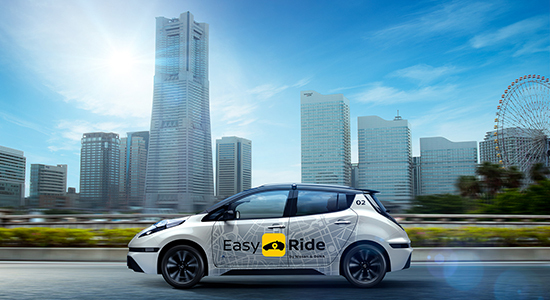 Nissan Motor Co., Ltd. and DeNA Co., Ltd. jointly unveiled the Easy Ride brand for the new robo-vehicle mobility service that the two companies have teamed to develop. They are planning to conduct public trials of the service shortly in the Minatomirai district of Yokohama, Kanagawa Prefecture, Japan from March 5, 2018, to March 18, 2018. The two companies started working together on a new mobility service employing autonomous driving technology in January 2017. While DeNA brings to the partnership its expertise in internet and artificial intelligence while Nissan contributes its technological assets in autonomous driving, vehicle electrification and connected cars. The concept of EasyRide is “more freedom of mobility” and it is visualized as a service that is available for anyone who wants to travel freely to their destination of choice in a robo-vehicle. Eventually, customers will be able to use a dedicated mobile app for the complete process from setting destinations and summoning vehicles to paying the fare. Depending on what they plan to do, whether it is for sightseeing, shopping or for having a meal out, they can also choose from a list of recommended local destinations and sightseeing routes. The two partners plan to support multiple languages and to use a remote monitoring system in order to ensure customer safety. Nissan and DeNA conducted a technical field test using an autonomous vehicle this year. They are planning to recruit participants for the trials in March from the general public in the period upto January 15 through the Easy Ride website, https://easy-ride.com.